Why visit Tuolumne Meadows? There's just something about a meadow that's good for your peace of mind. And this is one of the great meadows, nearly two miles (3.2 km) long, with a river (the Tuolumne) winding through it and a variety of picturesque granite peaks and domes surrounding it. Best Time to Visit: It's pretty whenever you can get there, but it's especially striking early in the season, when the meadow is oh-so-green and full of wildflowers. And early comes later to Tuolumne Meadows than it does to the foothills or Yosemite Valley, so even if you overhibernated, there's still a good chance you can catch spring in Tuolumne Meadows. Crowd Factor: It's a popular spot, but it's big, too, so you won't be elbow to elbow with your fellow blissed-out wanderers. Difficulty: Tuolumne Meadows is an easy stroll; it rates a 1 or 2 out of 10, depending on how far you choose to go. About the only way to make this difficult is to turn Tuolumne Meadows into your running trail (it's a great place for a run, by the way); you'll soon realize that you're above 8,000 feet. Parking: There's parking scattered along the length of the meadow, in small lots and along the shoulders of the road. Starting from the center of the meadow will give you quick access to a picturesque bridge and the Soda Springs, but you can also find trails at the edges. Here's a Google Street View panorama of the central trailhead, shot fairly early in the year before the meadow had turned green. Getting There: From Yosemite Valley, take highway 120 ten miles (16.8 km) to the Crane Flat turnoff onto Tioga Road, then take Tioga Road 38 miles (61 km) east to reach the meadows. 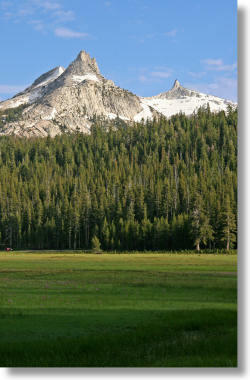 From Yosemite's east entrance at Tioga Pass, take the Tioga Road west 8 miles (13 km) to the meadows. Hazards: In wet, marshy years, enter the meadow in the evenings without mosquito repellent at your own peril. You might also find things nippy if you hang out near the river, especially where it pools up near the west end of the meadow.